Asset packages, available on the Unity Asset Store, which allow you to share and re-use Unity Projects and collections of Assets. Unity packages, available through the Package Manager window. You can import a wide range of Assets, including plug-ins directly into Unity with this type of package. This section provides information about using Asset packages in Unity. Unity Standard Assets and items on the Unity Asset Store are supplied in packages, which are collections of files and data from Unity Projects, or elements of Projects, which are compressed and stored in one file, similar to zip files. Like zip files, a package maintains its original directory structure when it is unpacked, as well as meta-data about Assets (such as import settings and links to other Assets). In Unity, the menu option Export Package compresses and stores the collection, while Import Package unpacks the collection into your currently open Unity Project. You can import Standard Asset Packages, which are Asset collections pre-made and supplied with Unity, and Custom Packages, which are made by people using Unity. Choose Assets > Import Package to import both types of Asset packages. Open the Project you want to import Assets into. You can import custom packages which have been exported from your own Projects or from Projects made by other Unity users. Choose Assets > Import Package > Custom Package… to bring up up File Explorer (Windows) or Finder (Mac). Standard Assets do not upgrade automatically when you upgrade the Editor. When you create a new Project in Unity, you can choose to include Standard Assets collections in your Project. Unity copies the Assets you choose to include from the Unity install folder into your new Project folder. This means that if you upgrade your Unity Editor to a newer version, the Standard Assets you have already imported into your Project do not upgrade: you have to manually upgrade them. Hint: A newer version of a Standard Asset might behave differently in your existing installation (for performance or quality reasons, for example). A newer version might make your Project look or behave differently and you may need to re-tweak its parameters. Check the package contents and Unity’s release notes before you decide to re-install. Open the Project you want to export Assets from. In the dialog box, select the Assets you want to include in the package by clicking on the boxes so they are checked. Leave the include dependencies box checked to auto-select any Assets used by the ones you have selected. Name and save the package anywhere you like. 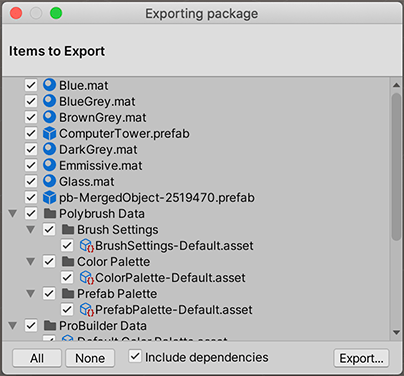 Hint: When exporting a package Unity can export all dependencies as well. So, for example, if you select a Scene and export a package with all dependencies, then all models, Textures and other Assets that appear in the scene will be exported as well. This can be a quick way of exporting a bunch of Assets without manually locating them all. 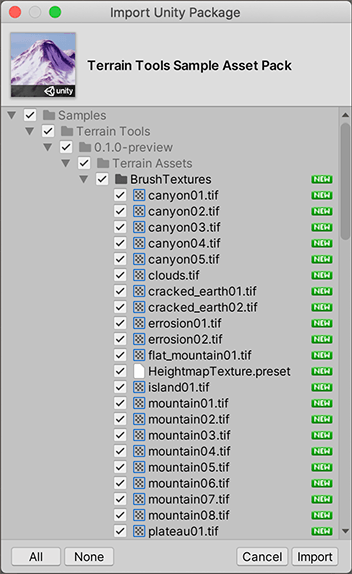 Select the Asset files you want in your package (select both the unchanged ones and the new ones). Export the files as described above in Export Package, above. Note: You can re-name an updated package and Unity will recognise it as an update, so you can use incremental naming, for example: MyAssetPackageVer1, MyAssetPackageVer2. Hint: It is not good practice to remove files from packages and then replace them with the same name: Unity will recognize them as different and possibly conflicting files and so display a warning symbol when they are imported. If you have removed a file and then decide to replace it, it is better to give it a different but related name to the original.